Have you ever cried during a children's movie? Not because of the usually horrible circumstances setting up the movie (Sorry about your mom, Nemo. You too, Bambi. Same to you, Cinderella. Belle, Ariel...not sure what happened there but I bet it wasn't fun. Sorry about that. ), but because of something that seems to speak directly to your life? No?! Well I have. 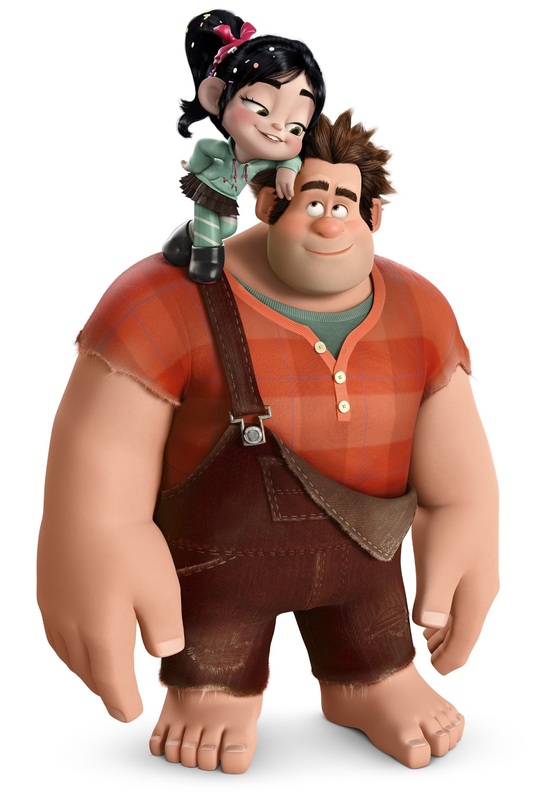 Lately we've been obsessed with Wreck-It Ralph. Sweet Girl was first introduced to this movie at school. They watched some day before a holiday or something, and though she did watch some of it from under Ms. Wellen's desk, Ms. Brown assured me that she watched most of it without any major issues. I had been concerned because even simple things like watching a new movie can sometimes be a very dramatic affair fraught with anxiety and uncertainty for my girl. But she watched. Then we purchased it on DVD. Then Sean took the kids to New Jersey. And it was during that drive that Wreck-It Ralph forever became a part of our family. It might just be a movie to some people, but to those of us who have watched it a hundred times, heard the words echoed back to us and manipulated to fit every kind of situation, watched their kids use scenes as constructs for play time, then this movie is way more than pixels on a screen. If you haven't seen it, let me give you a quick synopsis: Ralph is a bad guy. He wrecks the building in Niceland and Felix (né Fix It Felix Jr.) must repair the damage with his golden hammer and mad hopping skills. They're a classic arcade game (30 years old to be exact) and Ralph is searching for more than smashing, living alone, and the stigma of being a bad guy. He goes looking for a change and finds his way into two other video games. The majority of the movie takes place in a game called Sugar Rush where he becomes friends with another character; Vanellope von Schweetz. Vanellope's goal is to become a real racer at Sugar Rush Speedway. Every night, the characters hold a Random Roster Race to determine what options will be given to the gamers for the next day's races. Vanellope needs to enter and come in the top nine to do that. But to enter, one must have a gold coin which one gets from previous races. See the problem here? Ralph shows up with a stole medal that closely resembles a gold coin, and after purloining Ralph's medal Vanellope uses it to purchase a spot in the race. There is a lot of other action in the movie, including a megalomaniacal king who manipulates game code, but that's the basic premise and I'll assure you that all ends well. There are funny moments and touching moments - even some legitimate sad moments - but probably nothing that warranted the full on waterfall of tears I had going on the first time I actually paid attention to what Sweet Girl and Little Man were watching. There's a scene where Vanellope is showing her handmade kart to the other racers. The other racers were already determined not to race with a "glitch" (the term used by all the citizens of Sugar Rush to describe Vanellope and keep her from participating in any races), even though Vanellope has used Ralph's medal to purchase her spot in the Random Roster Race. Vanellope shows the other racers "the fastest pedal power this side of the Whack-A-Mole" with pride. She had no other option but to build her own cart from things she finds around Sugar Rush. The other racers, who have real karts with engines, tell Vanellope that she can't race for her own good. They say that Vanellope will not only embarrass herself with her slow kart, but that she's an accident waiting to happen. That her glitch will be her undoing. And then the racers proceed to destroy Vanellope's kart. When I watched this scene my heart broke into as many pieces as the sugar cone hood on Vanellope's kart. Because through my tear-blurred vision Sweet Girl stood in Vanellope's place. Communication and language delays come with autism for Sweet Girl, and so instead of using the sleek, fast-moving, mostly inherent language processing the rest of us use (with little to no appreciation of such processing I might add....I mean, I never thought about it until I saw my girl struggle) she uses things she finds to construct her language and communication. Today she used a script from Sophia the First to tell me that she wanted me to play tea party with her. The words "Mommy, please play tea party with me." don't come naturally to her and so she's used other means to communicate. I was invited to the castle, instructed to sit like a princess, and then given my tea. We reached the goal she had, but we took longer to get there and we had to work harder at it. Just like Vanellope and her pedal kart. And just like Vanellope, I know that my girl will come up against people that see the clumsy parts - the awkward ways in which she goes at talking and communicating - rather than the immense amount of hard work. I know that she will have to work four times as hard to go half as fast. And I know that there will be people who only see the glitch. My heart aches. But even more difficult than that was when I had to admit that in the movie of our lives, I'm playing the role of Ralph. [Sidebar: Ralph was my father's inexplicable nickname for me as a child. My sister was Ruby, my brother was Roscoe (Dukes of Hazard), and I was Ralph. All for no apparent reason.] Now, Ralph's not really a bad guy. I mean, yes, he's the bad guy in his game, but he's not a guy that's bad. He's actually pretty nice and I understand his desire for more out of life than the one role he's been playing for 30 years, or at the very least for some appreciation for playing that role well. Ralph just needs a little something for himself, ya know? Oddly enough, he finds it helping Vanellope. When he and Vanellope manage to obtain a real kart for her to use, they realize that she doesn't even know how to drive. Ralph immediately begins pounding out a track for her to use in practice. And I thought: "Of course that's what you do. If there is something, anything, you can do to try to level the playing field just the littlest of bits then you do it. You pound the crap out of the floor in Diet Cola Mountain and you make that kid a race track." And I'm right. You do whatever it takes. You log hours in waiting rooms. You wait out tantrums. You give them eight blankets. You shop at Whole Foods. Because what wouldn't you do for your kids? What wouldn't you do to make the path a little clearer? Any parent of any child: What wouldn't you do if you can? That was the easy part though. The hard part came later when Ralph used his wrecking skills to destroy Vanellope's new kart. While he thought he was doing it for her own good - taking her out of the race so that she wouldn't put the whole game and her own life at jeopardy (glitches can't leave their own games so if they get unplugged then Vanellope dies) - I watched that scene in horror as I saw myself in the destruction. How many times have I thought that Sweet Girl shouldn't try something because it might be too difficult for her? That people might laugh and be cruel or that it would just be too overwhelming for the delicate balancing act she does with her anxiety? How many times have I put my thoughts before her? This past winter I was concerned that Sweet Girl would not be able to participate in the Winter Concert at school. True, she loves singing and she certainly knew the songs they were performing but I didn't know if she could be on stage with her peers and handle all that goes along with that. I talked to Ms. Brown about it. I talked to the music teacher about it. I talked to Sean about it. But it didn't occur to me to talk to Sweet Girl about it until the night of the concert. I asked her if she wanted to do it. She looked at me and said: "Um, well, maaaaaayyyyyybbbbbbeeeee." And then Sean showed her the dress. And she was the belle of the ball and wanted to do whatever it took to wear the dress. I worried. I fretted. I talked to Ms. Brown again. I prayed a thousand small prayers. Mostly because I didn't want her to feel overwhelmed, but another ugly part of me didn't want her to stand out. I didn't want her to feel that people were judging her and I was one musical interlude from pulling her before she even walked on stage. But I didn't. And instead of me smashing her kart before she could race, she stood on stage slightly apart from her peers and she sang about half the words to the song. It was glorious. Heaven's own angels could not sing so melodiously as the junior kindergarten/kindergarten rendition of "Frosty the Snowman" that night. I nearly ruined that experience for her before she even got the opportunity. Damn it, Ralph. The real rub to that one is that Sweet Girl doesn't feel the judgment of others. She cares little if others see her as a glitch. This is also true to form for Sweet Girl playing Vanellope. In the end, it turns out that Vanellope has the chance to rid herself of her "pixlexic" glitch. Instead, and I could kiss all the employees at Disney animation for this, she chooses to keep it as a strength rather than make herself like the other racers. Ralph redeems himself and makes his life better. He's still the bad guy: that's his job after all. But he understands that he's more than his role in his game. That made me feel a little better about myself. That if I can remember to put some faith in my kids and in the world, and just take a deep breath sometimes, we'll be OK. Glitches aren't necessarily a bad thing. It won't be perfect but nothing is. I'm happy to be the bad guy if it means that my kids get what they need, from fights over what's served for dinner to getting services for special needs. I'll be the bad guy for that. And just like the Bad Guy Affirmation, there's no one else I'd rather be. Watching that and reading your last post has me really thinking about "Rules" where the main character just wants her ASD brother to fit in, to understand how to "properly" behave in public. It all breaks my heart. I need to work harder on remembering that. this is soo awesome, you are such a great mom!! carrie, you are perfect in your role also.. all your nieces and nephews were blessed to have you for an aunt! Been there, done that, again and again. I'm still struggling with choices we made for One years ago, but an interesting thing happened this morning. Four was at the breakfast table and One came in to get his food. Four said, "That must be hard for someone with cerebral palsy." This year Four had to research a disease for science and was assigned that one. He was pretty shocked to find out his older brother has it, but One said, (slightly annoyed) "It's no big deal, Four, I'm just a person with a disease. I don't even think about it." It's very hard not to think about it when you're the parent.